This research was supported in part by the USDA Forest Service and the Commonwealth of Massachusetts Department of Environmental Management. The authors also wish to acknowledge and thank the municipal officials of the town of Amherst, Massachusetts for their cooperation in setting up the pilot study of this project. Large-scale storm events that cause excessive tree damage can rapidly compromise public safety. Communities manage such catastrophes with varying degrees of efficiency and often rely on aid from state and federal government agencies to fund hazard reduction and debris removal. That aid depends significantly on the ability to estimate storm damage accurately and quickly. To date, however, there is no standard procedure for assessing the amount of damage that severe storms cause to trees on a community or regional basis. This protocol introduces a standard method to assess widespread storm damage in a simple, credible, and efficient manner immediately after a severe storm. This assessment method is adaptable to various community types and sizes, and it provides information on the time and funds needed to mitigate storm damage. The protocol involves a planning stage that evaluates a communitys street-side and adjacent trees, and estimates the amount of cleanup that might be needed after a severe storm. In the planning stage, sample plots are randomly chosen in a community, a survey is performed, and time and cost estimates are made. Once a storm has passed and community-wide damage is evident, the same sample plots are re-surveyed. A qualified damage assessor evaluates the tree damage in each plot and uses the data to estimate the initial resources necessary for hazard mitigation and debris cleanup for the entire community. Since speed is critical under post-storm conditions, electronic media are recommended but are not required. A form was developed in Microsofts Excelâ here so that all computations would be carried out automatically as soon as the field data were entered. Another electronic means, a data collection application developed with Pendragon Forms 3.1 software for use on personal digital assistants using the Palm OS, was also developed to facilitate data collection and entry. Key words. Storm damage; damage assessment; street trees; municipal forestry. 1 USDA Forest Service Urban Forester and coordinator of the Northeast Center for Urban and Community Forestry at the University of Massachusetts, Amherst. 2 Associate Professor of Urban Forestry, Department of Forestry and Wildlife Management, University of Massachusetts, Amherst. 3Davey Resource Group, 6050 Hicks Road, Naples, New York 14512. 4 Former Tree Warden of Boston and forestry graduate student. Now working as an urban forestry consultant. In the Northeastern United States it is not a question of whether a severe storm will strike a community and its trees, but when. For example, ice storms occur more frequently in northern New York and New England than in most other areas of the country (DeGaetano, 2000). In New York, at least 14 major ice storms have been recorded since 1884, or a major ice storm about every 8 years (Lemon, 1961; Seischab et al., 1993; Sisinni et al., 1995; Irland, 1998). Large-scale or regional storms that cause excessive tree damage can rapidly compromise public safety and result in a state of emergency declared at the state or federal level. State emergency management agencies usually require a community to submit an initial damage estimate within twelve hours after the end of the severe storm, even if they have not yet declared a state of emergency (Massachusetts Emergency Management Agency, 1995). This estimate should be realistic and credible, and is necessary to initiate the reimbursement process. The initial estimate of costs related to storm-damaged trees can vary widely among different communities, even if the amount or type of damage is similar. In a survey of fourteen western Massachusetts communities, following a severe blizzard in April of 1997, reported initial estimates of tree damage ranged from $1.00 to $100.00 per tree (Bloniarz, 1997). During a storm emergency, community officials often complete the initial damage assessment while they are involved in crisis management. Communication with emergency response personnel or a quick windshield survey of impacted areas is a common damage assessment protocol. Communities managing a crisis (as opposed to executing a planned response) risk negative publicity, as it is inferred that they were unprepared for the storm (Sievert, 1996). A planned responsethat is, having a storm damage assessment protocol in place before the storm strikes and having a qualified damage assessor assigned to complete the assessmentwill also allow community officials to concentrate on emergency response activities. Once the assessment is completed, it can be forwarded to the proper agencies with little interruption in emergency management procedures. What Storm Data Should Be Collected? Each community has differing capabilities to deal with storm-related emergencies. Because of this, FEMA recommends that each community have an Emergency Operation Plan and, since debris removal is reported as the most significant storm-related problem, a Debris Management Plan (FEMA, 1999). FEMA will reimburse a community for debris removal costs if a federal disaster has been declared. The Debris Management Plan is usually developed around the potential creation of cubic yards of debris from natural disasters. Although debris may come from many sources such as buildings and trees, this assessment protocol will provide information only on debris from trees and damage to the existing tree resource. In addition to providing funding for debris cleanup, FEMA will reimburse communities for removing certain trees if a federal disaster is declared. Trees that sustain greater than 50% crown loss (Figure 1) and are on the public right-of-way (ROW) are eligible for removal cost reimbursement (FEMA, 1999). However, trees that are completely on the ground after a storm and can be moved away with other debris on the ground are usually included with debris estimates. Finally, FEMA will also reimburse communities for hazard reduction pruning immediately following a storm where a federal disaster has been declared. In general, broken or hanging branches that are two inches or greater in diameter and that are still in the crown of the tree can be pruned under the hazard reduction reimbursement policy (FEMA, 1999). The pruning cost is not extended to the entire tree but is limited only to the removal of branches directly contributing to the hazard. The storm assessment protocol is intended to provide this information in a timely fashion immediately after a storm. It is important to keep in mind that the protocol is not a replacement for the more extensive full-scale surveys or estimates of damage to trees that would typically occur in the days and weeks after a storm emergency. Full-scale surveys are need to more accurately estimate damage and direct cleanup work after a storm. Final reimbursement of storm-related damages from FEMA and state emergency management agencies is dependent on accurate record keeping and documentation of storm-related cleanup work. An important consideration is the type of natural disaster that inflicts that damage on the tree resource. Ice, snow, windstorms, floods, and other natural disasters create different types and amounts of damage. Clearly, one assessment method will not be useful to all these different types of disasters. The storm assessment protocol that is presented here is applicable to natural disasters where similar amounts and type of damage are present over an entire community. Where damage is limited to localized areas, which often occurs with windstorms or floods, other approaches to estimating storm damage may be needed; one of these approaches is also presented. This protocol was intended primarily for populated areas with streets, but it can be adapted to rural roads as well as to areas without lined up trees. See Appendix C.
The storm damage assessment protocol can be completed in a number of formats. The data can be collected and processed entirely on paper with only a random number generator (calculator, spreadsheet, tables, etc.). Data collection and processing can also be done almost entirely in an electronic format. Alternatively, a combination of paper data collection and electronic processing can be used. For communities where all data collection and processing will be completed on paper, field useable versions of all the forms in this document are presented in Appendix A. Field data can also be both collected and processed electronically. Electronic versions of the data collection sheets have developed with software (Forms 3.1) distributed by Pendragon Software (www.pendragonsoftware.com) for use on personal digital assistants (PDAs) based on the Palm OS such as Palms Pilot or Handsprings Visor. Field data collected on PDAs can be uploaded to a computer for processing in a spreadsheet. These electronic versions are available from the Northeast Center for Urban and Community Forestry (http://www.umass.edu/urbantree/). An efficient method may be to combine these methods by collecting data manually on the forms provided here, then entering it into a spreadsheet for processing. An Excelâ template has been developed here for processing field data to calculate storm damage potential, and it is available from the Northeast Center for Urban and Community Forestry. Chart 1 outlines the five steps to establish the planning stage of this setup process. After a community has completed these steps, it will be ready to quickly assess storm damage when it occurs. The setup process may also be helpful to a community in planning its storm damage response, since it will provide estimates of the potential storm impact and resources needed to clean up damage to the urban forest. Step 1 is to obtain an accurate, scaled street map of the community. The street map is needed to select streets for an initial sampling of existing trees and to later locate these sample streets after a storm passes. Step 2 is to obtain knowledge of the communitys road system in order to obtain total street mileage and to set up permanent survey plots. The street mileage and ROW information is usually available from the communitys governmental offices, such as public works, highway, or engineering department. Step 3 is to complete a sampling of street-side and adjacent trees to allow an estimate of pre-storm cleanup and damage potential in the entire community. Step 4 is a summary of pre-storm cleanup costs based on the field samples. Both the amount of tree-related work and the amount of debris will be estimated in this step. Step 5 is to identify and train a qualified assessor who can complete the survey work after a storm, and to reliably store all maps, plot information, and contact lists so they can be readily located in the future. A detailed outline of the five steps outlined above is presented in depth below, along with a description of the necessary materials. The first step in the process is to obtain the most recent version of a scaled street map (street map with a scale printed on it that allows street lengths to be calculated) of the community. This map is typically available in the public works, highway, or engineering department. Alternatively, if a scaled base map is not available, it can be created with one of the computer mapping programs that contain street maps for all communities in a geographic region (Appendix B). Once the map has been obtained, physically cross off or mark off any roads on the maps that are not public roads, "paper" (or planned) roads that have not yet been developed, or roads that would not be maintained in a storm emergency. It is also important to determine whether state highways or county roads are the responsibility of the community in a storm emergency. If the community will not clean up these roads, or if they will not be included in storm damage estimates, they should be marked off. Also, be sure to mark off alley ways, park roads, private drives, roads in military bases, or highway access roads that are not under community maintenance or clean-up activities. Be aware that street maps obtained from computer software programs often have a substantial number of planned roads; these will need to be deleted. Physically marking off roads on a master copy of the base map is critical because in some cases sample plots on streets (described in the next step) can be generated by a computer. When computer data are transferred to the base map, it can then be determined if the street or sample plot should be included in the project. The ROW width of each street in the community is needed to determine what trees are under public maintenance and to determine what trees will be included in the survey. This information should be obtained from the communitys engineering, highway, or public works department. It will be used later in Step 3 when field sampling selected plots. If the ROW information is not available or is missing, alternative methods of evaluating the ROW are presented with the field sampling methods in Step 3. The next part of this step is to determine the total street mileage that would be the responsibility of the community to clean up after a storm. This can usually be obtained through the communitys engineering, highway, or public works department. Be sure to exclude the mileage from any of the streets marked off of the master copy of the community map. An alternative method that might be useful in smaller communities is to physically measure the street mileage off the scaled street maps. The length of each road would be measured on the map and the total length multiplied by the scale (e.g., 1 inch = 2,500 feet) would provide a total street mileage estimate for the community. These highway data may already be available through the state Department of Transportation (as in New York State, with the DOTs Local Highway Inventory). No matter what method is used, it is critical to omit streets that will not be included in cleanup efforts. This is an important consideration in smaller communities because state and county roads can make up a substantial portion of the total road mileage. On rural roads and in non-linear areas, see the techniques spelled out in Appendix C.
When Step 1 is completed, you should have a map with only the public roads that will be included in storm damage cleanup. The ROW information for the communitys streets should be available for the streets that will have permanent plots established on them in the next step. Also, total street mileage should be known for public streets that will be included in any storm damage cleanup. Step 2 will establish a series of permanent sample plots that will be used to represent the entire community. Each plot will be a randomly chosen portion of a street or road. Field inventory of the plots will allow estimation of the storm damage potential to trees in the entire community. The same plots will be surveyed immediately after a storm to estimate the amount of tree damage and cleanup needed for a community. The sample plots will be randomly chosen from the public roads identified in the Step 1. When the lengths of all the sample segments are added together, the total should constitute at least 2% of the total street miles in the community (minimum of 10 plots for any community). It is a good idea to create about 20% more sample plots than is actually needed to obtain the 2% of street miles. For example, if 30 plots are needed in the community then an additional six plots (30 ´ 0.2 = 6) plots should be set up; sample plots that cannot be used in the field can be replaced with these additional plots. A number of methods can be used to randomly select the sample plots. For small to medium communities, a simple, hands-on method is described in Appendix C. This method is probably the easiest and quickest for small communities; however, it can be used in a community of any size. Random selection of sample plots is essential because it allows damage estimates to be projected for the entire community based on the field inventory of the plots. The random selection process described in Appendix C could be tedious for bigger cities with a large number of street miles. It could be simplified using a computer-generated selection of sample plots. This selection process would require that the community have a geographic information system with a street database in it, and a trained operator who could set up the selection process. In populated areas, each sample plot will consist of a street segment, also known as a "blockside", which is bound by intersecting streets (Figure 2) on either end. The intersecting streets include dead ends and "T" intersections as well as four-way intersections. These street segments will vary in length but they provide an easily identifiable unit that can be quickly located and sampled in a storm emergency. Long streets with no intersections should be broken up in order that no single street should dominate the sample. We suggest an upper limit of something like 1050 feet (about 350 paces at 1 pace = 3 ft, or about 0.2 mi on an odometer), because field experience has shown that such a segment is large enough to avoid dividing too many blocksides, but small enough to keep any segment from being over-represented. It may prove convenient to allow a 10% overrun in length to make field and office work easier. For blocksides that are longer than the upper limit (here, 1050 feet, or 1150 if the overrun is allowed) the street will be divided up into separate segments for selecting samples (Figure 3). The same segmentation technique can be used to identify plots on roads and highways in unpopulated areas (see Appendix C). After the street segments are identified by hand or computer, the samples should be circled, highlighted, or otherwise marked on the street map. The length of each segment should then be known by measuring the scaled map, and the plot should have a unique number assigned to it on the map. For administrative and record-keeping purposes, a list of sample plots with their unique number and length should be entered into Form 1 (Appendix A) or an electronic equivalent. This form will allow the surveyor to record when each plot has been sampled (in both pre- and post-storm surveys), to track the street length of sample plots, and to facilitate changing sample plots when necessary. Blocksides are bound by two intersecting streets or an intersecting street and a dead end. Each blockside could be a plot if it were selected in the random selection process described in Step 2. Figure 3. Example of labeled street segments including a number of blocksides on Stanwood that are longer than 1150 feet and have multiple segments. When Step 2 is completed, the map should have each sample plot (street or road segment) marked on it each with a unique number. The length of each segment selected as a sample plot should be determined and entered into Form 1, and the total street length of the sample plots should equal approximately 2% of the total street miles in the community (minimum 10 plots). After the locations of all the sample plots have been identified on the community scaled street map, each sample plot will be surveyed in the field. A separate data collection sheet (Form 2) will be filled out for each sample plot. The person doing the field survey can be a community employee, a private contractor, or a volunteer. It is recommended that the person doing the pre-storm field survey also be the one responsible for the post-storm damage survey; however, this is not absolutely necessary as long as adequate training is provided to both. More details on the post-storm assessor requirements are provided in Step 5. To start the field survey, first locate the street segment on the map and go to it in the field. At the start of the plot, fill out all header information on the top of the sample plot sheet (Form 2). This includes the "on" street or the street the trees are physically on, the "from" street or the nearest intersecting street that identifies where the plot begins, and the "to" street or the street that marks the end of the plot (Figure 2). Be sure to enter the plot number in the upper right hand corner of the data collection sheet. If the plot starts in the middle of a long street or road, measure the distance (pace it off on foot, use a measuring wheel, locate it with your odometer, etc.) to the beginning of the plot in feet from the "from" street. The distance measured to the beginning of the plot on long street segments will be some multiple of approximately 1050 feet depending on how many plots there are from the starting point to the plot being sampled. In Figure 3, for instance, the beginning of plot 20 would be 1050 feet from the corner of Stanwood and Hennessey. The end of the plot will be a maximum of 1050 feet from the starting point. This is described in more detail in Appendix C. After making these measurements, the start and end of the plot should be identified (and adjusted if necessary so that the plot can be found quickly under post-storm conditions) using local street features such as a house address, telephone pole number, or other easily identifiable permanent markers. These features should be clearly described on the plot data collection sheet. In each sample plot in a populated area, any tree greater than or equal to 6 inches in diameter at breast height (DBH) that is on the ROW or is within 50 feet from the edge of the ROW will be surveyed. In rural, unpopulated areas, only ROW trees will be counted, and DBH will not be measured. The reason for this difference is that FEMA will reimburse the costs of debris that can be hauled to the curbside by residents, so off ROW trees must be included in estimations of potential debris in populated areas. Trees on both sides of the plot will be counted. Dead trees should not be counted. If a tree is on the border of the either the edge of the ROW or edge of the sample area, measure to the center of the trunk to determine whether the tree should be counted as in the ROW orfor populated areas-- within 50 feet of the edge of the ROW. If a median is present on the street, count all the trees in the median. No information will be collected on tree species or other characteristics, even though trees in poor condition and even particular species tend to produce more debris than others [Hauer et al, 1993; Sisinni et al, 1995;]. The reason for the survey is to identify any tree that may have to be removed or pruned on the ROW, or that may contribute brush that could fall or be dragged into the ROW after the storm. Note that data for trees that are on and off the ROW will be tallied separately on the field data collection sheet. Data will be collected on each tree using diameter at breast height (DBH) categories (details in Appendix E). Acceptable methods of determining DBH are measurement with a Biltmore stick, use of a diameter tape, or--for experienced data collectors--visual assessment of DBH with periodic confirmation. Each tree will be categorized using six-inch DBH categories, ignoring any tree under 6" in diameter. Form 2 is set up to collect these data using a tally method (Appendix F). To complete the survey of the sample plot, the assessor will count all trees on each side of the street. In populated areas, each tree will be tallied in the proper DBH category and categorized by location, that is, whether it is 1) on the public ROW, or 2) off the ROW but within 50 feet of its edge. If the ROW information is not available for a street, the assessor can use field judgment (location of sidewalks, utilities, fences, etc.) to determine where the ROW ends. In many New England and New York communities, streets are often 49.5 feet (three rods) wide. This can be used as a convention in some cases to help determine the ROW width. In unpopulated rural areas, only ROW trees will be counted. After all sample plots have been visited and the data collection is completed, the pre-storm data analysis can begin. On each sample plot data collection sheet (Form 2), determine the total number of trees in each diameter class for both ROW and off ROW trees. Determine the total number of ROW and off ROW trees by adding down each of these columns and enter the number at the bottom of each Form 2. For the trees on the ROW, multiply the total number of trees by the time per tree in each diameter class for both the removal and pruning categories. This would give the total removal and pruning time for the plot as if all trees were both pruned and removed, so an adjustment will be made below in Step 4. Note that the estimated time per tree for removals does not include stump removal time. If stump removal will also be included it should be added to the time per tree. Depending on the storm event, stump removal may or may not be reimbursed by emergency management agencies. Determine the total hours for removal and pruning for the plot by adding down each column and enter the totals at the bottom of Form 2. When these calculations are completed for all the sample plots in the community, the data can then be transferred to the final data analysis sheet (Form 3). If the electronic Template is being used, the transfer is automatic from the Data worksheet to the Analysis worksheet. Step 4 is the final pre-storm data analysis and is completed on Form 3. This analysis is used to estimate total tree removal and pruning time and costs, brush amounts and cleanup costs, and total cleanup costs for the community based on the field data samples. The following description pertains to manual data analysis. The use of the "Storm Damage Estimate Template" (available from the Northeast Center for Urban and Community Forestry) makes this analysis vastly easier, since all calculations are carried out automatically as soon as the field data are entered. Since speed and convenience are important under emergency conditions, the use of the electronic "Template" is highly recommended. First enter the community name, state and total street mile information on the top of Form 3. Total street mileage was determined when setting up the street sampling plots. Total plot length was also determined in the setup but it may change after fieldwork begins as plot substitutions occur. Total plot length can also be determined by adding all the plot lengths from the field data collection sheets. Convert the total plot length from feet (at the bottom of the worksheet in Form 3) to miles by dividing the length by 5,280 before entering it at the top of the form. For each field sample plot, enter the plot length, the total number of trees on and off the ROW, and the total number of hours for removal and pruning (these total columns are light gray in the plot data collection sheet (Form 2). The other blank columns in Form 3 will be filled in based on the initial data. First, calculate tree density per 100 feet of street by multiplying the total for all trees in each plot by 100 and then dividing by the plot length. The next column in Form 3, "Brush", is determined by looking up the tree density per 100 feet in Table G-1 in Appendix G. Enter the appropriate cubic yards of brush for the tree density in the plot. This number is the cubic yards of brush that are typically generated per 100 feet in an ice storm. It is based upon actual records of debris caused by wind storms in the southeastern US (DRC 2000). It is critical that the estimated brush per 100 feet eventually be transferred to the post-storm data analysis sheet (Form 6) after it has been determined for all the field plots. These initial brush estimates are adjusted after a storm based on the canopy loss in the sample plots. The transfer can occur after a storm occurs, but for ease of use of the system it is best done as part of the pre-storm setup. Next calculate the total brush potential in the plot by multiplying the plot length by the total amount of brush per 100 feet (i.e., the column to the left) and dividing by 100. Do these calculations for each plot. Total each column (except plot number) in the Form and enter the total plot length (if different than in Step 2), the total hours for removal and pruning, and total brush in the appropriate locations on the top of the form. For brush debris estimation, multiply the total brush (last column in form) by the total street miles and then divide by the total plot length. This is the total estimated debris from the community in cubic yards. Estimate brush cleanup cost by multiplying the total brush by the cost per cubic yard to dispose of the brush. Recommended brush clean-up costs are provided; these costs are estimated to range between $10 and $25 per cubic yard. These costs may need to be adjusted to reflect higher or lower transportation or disposal costs, excessive tipping charges, or other local factors. Estimate total cleanup cost for the community by adding the costs for tree removal (including stumps, if you so choose), hazard pruning, and brush cleanup. In the event of a storm emergency that causes widespread damage to trees it will be necessary to relocate and assess each sample plot in the community. It is recommended that two sets of the plot maps, plot location information, and post-storm data collection sheets be maintained. One set should be in the possession of the field survey crew(s) who will do the actual plot analysis. The second set should reside in a central, secure location with the community department in charge of storm cleanup. In the case that field survey crew(s) cannot locate the survey information or perform the post-storm fieldwork, the department can take over these operations. One of the primary reasons for conducting the pre- and post-storm data collection and summary is to provide community officials and state and federal agencies with a reliable estimation of storm damage quickly after a storm event. Data summaries for each community need to be communicated to the proper officials in a timely manner if the storm damage assessment effort is to be worthwhile. For this reason, local, state, and federal contact information should be archived with the storm assessment protocol information. This contact information can be recorded in Form 4. Transmission of the post-storm assessment information can be completed using pre-determined reporting methods such as telephone, fax, e-mail, or overnight mail. More than one predetermined method should be set up because of the likely interruption of communications during a major storm event. It is desirable that the same assessors be used for the pre-storm and post-storm surveys and that the person(s) have familiarity with trees and tree work. However, it is not necessary that the person be extensively experienced in estimating time and cost for tree cleanup as long as this training is provided on crown loss assessment and the general use of this protocol prior to post-storm implementation. The assessment system is set up to minimize the need for specialized experience to complete accurate fieldwork. If a community decides to establish sample plots using in-house staff and contract out the actual damage assessment, the person doing the post-storm assessment should be trained ahead of time on the location and protocol used to assess the sample plots. The assessor will also be outside in adverse and potentially dangerous conditions. Dependable communications with the local storm center or crisis coordinators via cellular phones, two-way radios or other methods, and a reliable vehicle (four-wheel drive in winter storm conditions) are advisable. Whoever does the post-storm assessment should not be obligated to participate in the initial emergency response and cleanup efforts during the time required to complete the survey of the storm assessment plots. They should also reside locally (or be available on short notice), be familiar with the area, and be able to meet all the storm assessment protocol requirements. The post-storm assessment is broken into three steps. Step 1 is to re-survey the sample plots that were established in the pre-storm setup and to do a brief data analysis on the plots. Step 2 is to project the amount of storm cleanup for the entire community based on the post-storm sample plot survey. Step 3 is to report the damage estimates to the appropriate local, state, and federal agencies. Each step is described in detail below. Once the storm has passed, the damage assessor can begin re-surveying the permanent plots that were established in the pre-storm setup. The assessor should follow a pre-planned, efficient route between plots, but should be aware of other routes in the event the planned route is blocked. Post-storm data collection should be completed within 12 hours after the storm has passed. For each permanent sample plot, the assessor will record 3 critical pieces of information on the damage assessment data collection sheet (Form 5). The number and size of trees on the ROW that will require removal. This category should include trees that are partially down (such as trees that are partially uprooted or leaning against other trees). The tree should be counted if any part of the tree is on or may fall into the street or ROW. The number and size of trees that have significant crown damage (50% or greater of the crown lost) but are still standing. Guides are available for estimating crown loss (Appendix H). Each tree for removal should be tallied in the appropriate diameter category on the data collection sheet. Trees that are completely on the ground are to be included in estimates of brush cleanup and therefore should not be included in the removal counts. The number and size of trees on the ROW that have hazardous branches. Here should be recorded broken or hanging branches that are two inches or greater in diameter and that are still in the crown of the tree. Each tree that will require hazard pruning should be counted and placed in the appropriate diameter category. Please note that hazard pruning is restricted to the removal of hanging or broken branches. Additional pruning to correct ripped branches or make proper pruning cuts of broken branches is not included. The percent of canopy loss on trees that are both on and off the ROW. For ease of judging, percent canopy loss should be estimated in discrete 100-foot segments in the plot for all trees that are on the ROW (and, in populated areas, within 50 feet of the edge of the ROW). Canopy loss should be estimated only on trees greater than 12 inches in diameter. If the electronic "Template" is being used, data analysis will be carried out automatically after the revised plot data are entered into the spreadsheet. The following description applies to manual data collection, entry, and analysis. First, a brief data analysis is needed for each field plot after the data is collected. Total all the tree removals and hazard prunes by diameter class. Then calculate the total hours of removal and pruning work by multiplying these totals by the time per tree required to complete the work. Sum the total hours of removal and pruning work down each column. Next total the canopy damage for all the 100-foot segments that were rated on the plot. Average the canopy loss in the plot by dividing this total by the number of 100-foot segments that were rated for canopy loss. For each field plot, transfer the total hours of removal and pruning work and the average canopy loss to the post-storm data collection sheet (Form 6) . Once the data from all the field plots have been entered in the post-storm data summary sheet (Form 5), data can then be used to estimate the total damage and resources needed to clean up entire communitys storm-damaged trees. Make sure that the total brush estimates from the pre-storm survey (Form 3) have been transferred to the post-storm data analysis sheet (Form 6). First, fill out all header information including the total street miles and total plot length. If the plots have been changed or if some plots could not be reached because of the storm, be sure to enter the total plot length from the bottom of the worksheet in Form 6. Also be sure to convert this total plot length in feet to miles by dividing by 5,280 feet. Total the hours for the removal and pruning work down the respective column on the worksheet in Form 6 and enter the totals in the proper location at the top of the form. Calculate the total hours for removals and pruning by multiplying the totals from the plots by the total street miles and then dividing by the total plot length. To calculate removal and pruning cost, multiply the total hours for each by the cost per man-hour for removal and pruning work. As discussed in the pre-storm analysis, this cost per hour may range between $45 and $65 per hour for a fully equipped person. Next, determine the adjusted brush per 100 feet for each plot. This is estimated by adjusting the total brush from the pre-storm analysis by the amount of canopy loss in the plot. Use Table G-2 in Appendix G to make this adjustment. The adjusted amount of brush per 100 feet is converted to total brush in the plot by multiplying the plot length in feet by the adjusted brush and then dividing by 100. This result is the total brush in the plot in cubic yards. Enter this total at the top of the form. Determine the total brush in the community by multiplying the adjusted brush by the total street miles and then dividing by the total plot length. Community-wide brush cleanup cost is estimated by multiplying the total adjusted brush by the cost per cubic yard for brush cleanup. The cost ranges between $10 and $25 per cubic yard as discussed in the pre-storm setup. The total cleanup cost for the community for tree removal, hazard pruning, and brush cleanup is estimated by adding the cost for each together at the end of the calculation sheet for Form 6. This dollar value is the number that is most commonly reported to local, state, and federal officials as soon as possible after a storm. The final cleanup cost for the community from Form 6 should be reported as soon as possible to the appropriate local, state, and/or federal authorities. Other values from the survey work, such as total number of tree removal hours, total number of hazard pruning hours, and total cubic yards of brush debris, could also be reported from Form 6. The electronic version of the data analysis also calculates total number of trees to be removed or hazard pruned based on the post-storm survey. These figures can also be calculated manually from the data in Form 6. The contact agencies for reporting information were identified in the pre-storm setup in Form 4, which was archived with the rest of the storm assessment information. These authorities should be contacted as soon as the final data analysis is completed. Windstorms, floods, and other natural disasters can produce damage that is localized to a geographic area. Assessing this damage on a community-wide basis will not produce realistic estimates of the actual storm damage, particularly if the damage is in an area with a few or no permanent plots. An alternative method of storm damage assessment may be needed in the case of localized natural disasters; one such alternative is described in Appendix G.
What became very apparent during the northern New England and New York ice storm of 1998 was that a uniform method was needed for measuring community tree damage immediately following a severe storm. This project proposes a methodology that can provide community, state, and federal emergency management officials with a system that estimates initial damage and projected cleanup costs. The system is simple and effective enough to complete within the twelve-hour window required for reporting initial damage assessment. It is important to note that this damage assessment method is a preliminary model. It is intended to provide an initial solution to estimating tree-related storm damage during the normally confusing hours immediately after a severe storm has impacted a community or region. The sampling method and accuracy still need to be tested in actual storm conditions and adjustments to the methodology should be made as practical experience dictates. The 1998 ice storm clearly identified a need for a storm damage assessment system, and communities should not wait for another regional, severe storm to justify its implementation. This storm damage assessment system can be a useful tool for emergency response, but its strength lies in the planning stage. Once successfully implemented, community and emergency response officials can focus on emergency management and public safety during and after a storm strikes. The often neglected task of providing the initial damage assessment to state and federal emergency management agencies will become one part of a well planned and executed program in a communitys emergency preparedness and response operations. Bloniarz, D. V. 1997. March 31/April 1 storm damage data compiled for the Massachusetts Department of Environmental Management by the Northeast Center for Urban and Community Forestry. University of Massachusetts, Amherst. Burban, L. L., and J. W. Andresen. 1994. Storms over the urban forest: planning responding, and re-greeningA community guide to natural disaster relief. Second edition. USDA Forest Service, Northeastern Area. DeGaetano, A. T. 2000. Climatic perspectives and impacts of the 1998 northern New York and New England ice storm. Bull. Am. Meteorol. Soc. 81:237-254. DRC. 2000. Personal communication. Disaster Recovery Company, Inc., 740 Museum Drive, Mobile Alabama. Hauer, R. J., Wang, Weishen, and Jeffrey O. Dawson. 1993. Ice storm damage to urban trees. J. Arboric. 19(4):187-193. Irland, L. C. 1998. Ice storm of 1998 and the forests of the Northeast. A preliminary assessment. J. Forestry (Sept 1998):32-40. Lemon, P. C. 1961. Forest ecology of ice storms. Bull. Torr. Bot. Club 88:21-29. Massachusetts Emergency Management Agency. 1995. Disaster assistance program reference guide. 5 pp. MEMA Disaster Recovery Department, Framingham, Massachusetts. Seischab, F. K., J. M. Bernard, and M. D. Eberle. 1993. Glaze damage to western New York forest communities. Bull. Torr. Bot. Club 120:64-72. Sievert, R. C. 1996. Preparing for storms and managing their impact. Arbor Age 16(11):34-37. Sisinni, S. M., W. C. Zipperer, and A. G. Pleninger. 1995. Impacts from a major ice storm: Street tree damage in Rochester, NY. J. Arboric. 21:156-167. These forms are for use in the field for data collection and for pre- and post-storm data analysis in communities where electronic versions of the protocol are not being used. Forms should be photocopied as needed to provide enough for all the plots and data collected in a community. The Field Data Collection forms are held in seperate files, written in Word or PDF format. Click below to download the forms in the format you find most useful. Modified from: Jerry Bond. Cornell Cooperative Extension of Monroe County, Rochester NY. NE Urban Forest Health Monitoring Project. 10 June 1999. Create a random selection of street trees that approximates 2% of the street miles. Blockside = longitudinal unit of location, indicating a stretch of street from intersection to intersection, or intersection to dead end. "Elbows" do not create separate blocks unless street names change. T-intersections (intersections that only insect on one side of the street) are included in the breaking up of blocksides (see Figure 2). (Street) Segment = Blockside, when block length is £ 1150 feet A blockside that is longer than 1150 feet is broken up into separate segments, each of which is to be 1050 feet long as described below. Plot = a segment that has been selected through a random process and verified as appropriate to the protocol being employed. 1. Assign a unique number to all public street blocksides. This is usually done manually on a scaled community map, and takes about 8 hours per 100 street miles. 2. Eliminate any blockside where trees are not maintained or roads would not be cleared. 4. 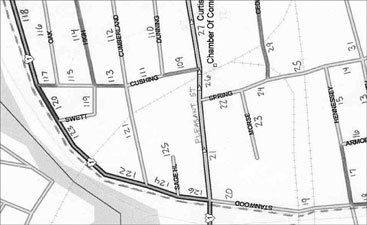 Create a list that includes all street segment numbers in the community. 5. Randomly select enough segments to supply the ground crew with approximately 2% of the total adjusted street mileage plus 20% extra (for example, if 30 plots are needed in the community then an additional six plots (30 ´ 0.2 = 6) plots should be set up). 6. Random selection is most easily done using a random number generator available in spreadsheets (in Excel, the most convenient function is RANDBETWEEN, part of the Analysis Pack add-in). Random numbers should be selected with replacement. Other possible means include random number tables, a calculator with a random number generator, or the use of a phone book, taking the last digits of consecutive phone numbers. 1. Some plots are included on long streets with multiple plots or segments. To locate the plot to be sampled, start at the low address end of the street and measure off 1050 feet per segment in the direction of increasing plot numbers until you reach the selected segment (for example if you want to sample the third segment, measure 2100 to the start of the third segment). set your trip odometer to zero. Each 0.1 miles equals 528 feet, so 0.2 miles (1056 feet) is a good approximation of the maximum segment length (1050 feet). measure out to the best of your ability 0.2 miles for each segment. stop when you have reached the approximate beginning of your segment, using multiples of 0.2 miles. declare that point the true beginning of your segment. from the beginning of the segment, measure off 1050 feet to the end of the plot with a measuring wheel, a vehicles odometer, or by taking 350 paces. the start and end of such segments that are part of long blocksides may be adjusted in the field for ease of post-storm relocation, but not to change the trees being surveyed. 3. Identify and describe on the data collection form permanent features in the field that can be used to locate the end of the plot again in the future. 1. Divide community (town, township, etc) roadsides into populated and unpopulated areas. This is usually done most easily with highlighters on a scaled map. 2. Treat the populated areas as described above and in the main text. Separate the roads in the unpopulated areas into treed and untreed categories. A road or road segment may be defined as "treed" if it has an average minimum tree density of 1 tree per 100 feet and includes at least 10 trees. Some roads may be entirely treed, others entirely untreed, and some a combination of the two. If a road has one populated and one unpopulated side (as in a housing development across from a woods, for example), split the plot (adding "A" and "B" to the plot number on the form), and use the appropriate protocol for each side. Measure the length of the treed roads and road segments as best you can, using either the scaled map or your odometer. For treed roads and road segments longer than 0.2 mi (1056 feet), follow the protocol already described for dividing them into smaller sample units. Determine the total mileage of the treed unpopulated roads, then randomly select segments until you have about 2% of the total mileage. Locate the selected segments in the field, adjusting their position so that they can easily be found again under post-storm conditions. For example, you might move the segment so that it can be described as "from Fred Joness driveway E to the next intersection," or "from utility pole #42 to the bridge over Minard Creek," or anything similar that will work easily for the post-storm assessor. Do not adjust the segment to change the number, age, or condition of the trees to be surveyed. Any such change would make the whole protocol invalid. Proceed with the survey of the sampled plots as with populated areas, making sure that you only include ROW trees. Non-linear plots should be establish to estimate storm damage in open spaces such as parks, greenways, golf courses or open other areas where no systematic road system is present. Data collection and analysis for non-linear plot data is similar to street data collection except that estimates are based on area rather than linear street miles. The forms 2C/5C (Maintained) and 2D/5D (Unmaintained) can used for parks and other open spaces, but the Template can not accommodate non-linear plots and calculations will have to be done by hand. Obtain a scaled map or aerial photo for the area for which non-linear plots are to be established. If part of the area is linear and has a different maintenance level from the remainder, separate out the linear portions and treat them as has already been explained above. In a park, for example, you might separate the roads from the rest because of the higher liability and maintenance levels. Determine whether different levels of maintenance exist for subsections of the non-linear portion. If yes, separate them into sub-areas. This way, different assumptions can be made about level and cost of post-storm maintenance so the estimates will be more accurate. In a park, you might want to separate trees surrounded by grass and park equipment from trees in a completely wooded area. Circle the non-linear sections on the map with a felt-tipped pen. If there are multiple maintenance levels involved, indicate the level of each section on the map. Use numbers, letters, H/M/L, or any other system to distinguish them. Lay a sheet with a grid or dots over the map, and count the number of intersections or dots that fall into each maintenance level. Each intersection or dot constitutes a plot center that could become selected for the random sample. The density of dots on the grid should be adjusted for the scale of the map. For example, a larger scale map (say 1 to 100) will require a lower density dot grid than a smaller scale map (1 to 1000). Randomly select about 2% of the total number of dots that fall in each maintenance level identified on the map. One way is to use two random numbers to determine how many intersections/dots over and how many up you would count to locate the plot center. After the dot is chosen highlight it on the map. For instance, if the two random numbers you came up with were 8 and 21, you would count across 8 intersections/dots from the right margin, then 21 up. The intersection/dot you land on becomes plot center for a sample plot. Make a list of the plot centers you have randomly chosen for the 2% sample. in the field determine from the map scale (and a compass, if necessary) the distance and direction necessary to locate each plot center on the ground. Establish a circle around your plot center that encloses 0.1 acre (about 373" in radius). Use flags or flagging tape if necessary to mark the plot perimeter. Proceed with the protocol already established for linear plots. If the area is un-maintained, use the data sheets for "unpopulated areas." If it is maintained, then use those for "populated areas." Adjust to you own particular situation if needed. Choose a method to quickly find the plot center again. Take a photo, put in a stake, or use any other means that will enable the post-storm assessor to relocate the plot. Alternatively, plot centers can be re-established or selected after a storm as long as there is no bias in the plot selection. Diameter at breast height will be recorded in inches with a diameter tape at 4.5 feet off the ground on the uphill side of the tree. For trees that fork at or near 4.5 feet, the tree should be measured below the fork and any obvious bulges related to the fork. For trees that fork at or near the ground, the stems should be measured separately and the diameters recorded for each stem should be summed. Exact tree measurements are not required on all trees. Acceptable methods of determining DBH are measurement with a Biltmore stick, use of a diameter tape, or for experienced data collectors, visual assessment of DBH with periodic use of the diameter tape or Biltmore stick to confirm judgment accuracy. Each tree will be categorized using six-inch DBH categories. Forms 2A, 2B, 5A, and 5B are set up to collect this data using a tally method (Appendix A). Estimating brush per foot based on land use type and tree density. Table G-1. Ice Storm brush production in cubic yards per 100 feet of street (both sides) for various tree densities. Data to make projections provided by DRC, Inc, 740 Museum Dr., Mobile, AL. Windstorms, floods, and other natural disasters can produce damage that is localized to a geographic area. Assessing this damage on a community-wide basis will not produce realistic estimates of the actual storm damage, particularly if the damage is in an area with a few or no permanent plots. An alternative method of storm damage assessment may be needed in the case of localized natural disasters. If a localized storm occurs, all the maps and data collection materials used in the pre-storm evaluation can be used, but in a slightly different manner. The first step is to determine the rough geographical area that the storm had affected. It may be necessary to assess this based on a quick windshield survey of the area. Next draw a boundary around the affected area on the street map from Step 1 in the pre-storm setup. Determine the total street miles in the affected area using the scaled street map or, if available, a geographic information system (GIS). Next establish a 2% sample of the estimated street miles in the area. Any plots from the pre-storm setup can be used if they fall in the affected area. This can be done using the protocol in Appendix C. When these steps are completed, the total miles in the affected area and the total miles of new plots should be known and marked on the map. Next, sample the field plots and collect the same information as in the post-storm data collection. The major exception is in the collection of the brush or debris data. Localized storms are usually the result of winds storms of floods. The amount of debris generated by these storms is different from that of an ice storm. The other steps in the data analysis are the same as is reported in the main text of this protocol. Estimates of tree removal and pruning for the affected area are based on the field sample.